View More In Statues & Bobbleheads. 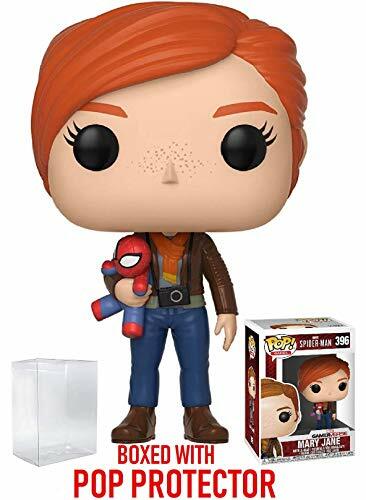 From the Spiderman Video Game, Mary Jane, as a stylized pop vinyl from Funko! figure stands 3 3/4 inches and comes in a window display box. Collect the entire Spiderman Videogame line of Funko Pop Vinyl's: Mary Jane, Mr. Negative, Unmasked Spider-man & Miles Morales. Collect the entire line of Spider-Man Homecoming Funko Pop! : Spider-Man, Spider-Man (Homemade Suit), Peter Parker, Tony Stark & Vulture. Collect the entire line of Marvel Comics Funko Pops! : Captain America, Iron man, Thor, Hulk, Spider-man, Wolverine, Deadpool, Black Widow, Venom, Winter Soldier, Black Panther, Antman, Daredevil, Punisher, Moon Knight, Luke Cage, Iron Fist, Falcon, Vision, Hawkeye, Scarlet Witch, Ghost Rider, Elektra, Doctor Strange, Jessica Jones, Spider Gwen, Tony Stark, Peter Parker, Blade, Loki, Silver Surfer, Green Goblin and more! Collect the entire line of Marvel Comics X-men Funko Pops! : Wolverine, Logan, Cable, Colossus, Mystique, Magneto, Beast, Emma Frost, Storm, Psylocke, Sabretooth, Cyclops, Professor X, Ice man, Archangel, Juggernaut, X-23, Quicksilver, Kitty Pryde and Dark Phoenix & many more. (Each Sold Separately) Includes a Pop box protector fit for any collectors investment. From Spider-Man Video Game, Mary Jane, as a stylized POP vinyl from Funko! Stylized collectible stands 3 ¾ inches tall, perfect for any Spider-Man fan!